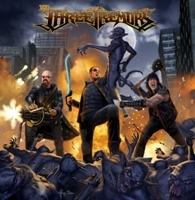 USA rules and consequently they offer us a new album with three of the most eminent vocalists of this continent with the release of a debut album of The Three Tremors. Sean Peck – the mastermind of the heavy metal band Cage, front man of Denner/Shermann and also active in Death Dealer – happens to be the initiator and composer of the songs on the debut album of The Three Tremors. He managed to convince Tim ‘Ripper’ Owens (ex-Judas Priest, ex-Iced Earth en Dio Disciples) and Harry ‘The Tyrant’ Conklin (Jag Panzer, Satan’s Host, Titan Force) to form a new conglomeration paying justice to pure heavy metal with high-pitched vocals. Thus we instantly think of Agent Steel and Mercyful Fate of course. Nothing wrong with that approach and so it turned into a very familiar album for eighties metal freaks. They managed to form a proper band around them, with guitarists Dave ‘Conan’ Garcia en Casey ‘The Sentinel’ Trask, while the rhythm section is made up of bassist Alex Pickard and drummer Seal Elg. Although we have a kind of overkill with three vocalists in shrieking, high-pitched vocals, this turns out to be quite a well-balanced album, combining pure heavy metal with a sniff of epic bliss (more doom-laden songs where Dio’s legacy stands proud such as ‘When The Last Screams Fade’ and the galloping ‘Speed To Burn’). Judas Priest references come up in ‘King Of The Monsters’, but fortunately they also have some heartfelt lower-ranged sung tunes such as ‘Sonic Suicide’ (with guitar extravaganza) and ‘Fly Or Die’. Any battle-like bravura is shown in the Manowar tinged ‘Lust Of The Blade’, being our ultimate favourite. Regaled with meritorious guitar skills, this debut happens to be a tribute to traditional heavy metal, with eminent vocalists? The essence of traditional heavy metal rules, although we are not convinced of every song. USA heerst en stort maar liefst een nieuw album met drie van de meest eminente vocalisten van dit continent over ons heen met de release van een debuutalbum van The Three Tremors. Sean Peck – de bezieler van heavy metal band Cage, frontman bij Denner/Shermann en ook actief in Death Dealer - is hier de initiatiefnemer en schrijver van de songs op het debuutalbum van The Three Tremors. Hij wist Tim ‘Ripper’ Owens (ex-Judas Priest, ex-Iced Earth en Dio Disciples) en Harry ‘The Tyrant’ Conklin (Jag Panzer, Satan’s Host, Titan Force) te overtuigen om een nieuw conglomeraat te vormen dat pure heavy metal met hoge vocalen eer aan zou doen. Dan denken we al meteen aan Agent Steel en Mercyful Fate natuurlijk. Niets mis met die aanpak en het is dan ook een heel herkenbaar album voor jaren tachtig metal freaks geworden.